Command The Field Drum Major & Leadership camps are short and condensed camps that provide leadership, conducting, and teaching fundamentals to drum majors and section leaders. 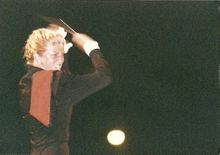 An emphasis is put on conducting using Laban dance movements. This skill is useful for the section leaders as well because if a student can conduct and understand the music then they will become better musicians all around and also better followers in the ensemble. Students will have an opportunity to conduct a live ensemble and will receive experiences that will prepare them for their roles when they return to their schools. The leadership aspect teaches the students how to set and achieve life-long goals.